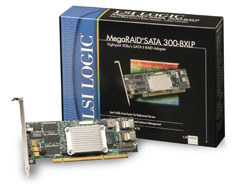 The MegaRAID® SATA (Serial ATA) 300-8XLP is the latest addition to the LSI family of SATA RAID solutions. Offering data transfer rates of up to 3 Gb/s per port in a low-profile form factor, the MegaRAID SATA 300-8XLP addresses the growing demand for RAID in high-density rack-mount chassis environments. Also, with the addition of individual drive activity and fault LED headers, you can view the status of hard drives through LEDs on the chassis. In addition to 3 Gb/s SATA transfer rates, the MegaRAID SATA 300-8XLP also supports Native Command Queuing (NCQ) and Enclosure Management (SAF-TE).